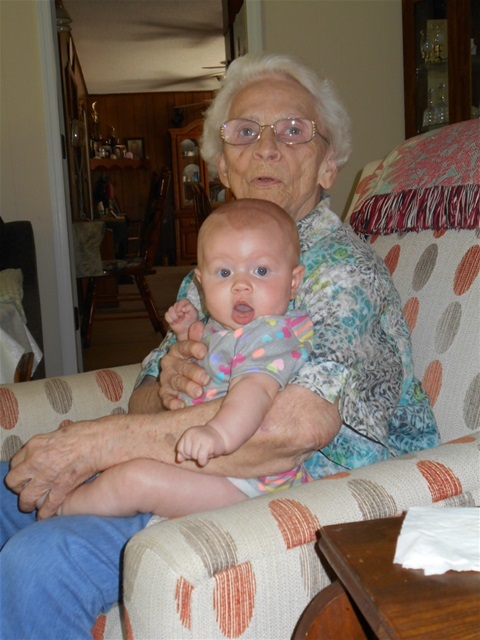 My husband and I recently took our granddaughter to meet her Great-Great-Aunt Janice and Great-Uncle Larry Frye. This was a momentous occasion for my husband and me. He was right. I love them all; Chuck, Pam, Cheryl, and Larry hold a very special place in my heart. My husband was excited to bring Holly over to meet his favorite aunt who is now 83 years old and it was for those two reasons: she’s his favorite, and their age gap. This was definitely a union of the generations. Aunt Janice looks so much like Granny now and reminds me so much of her. Larry Frye is still alive an kicking, too.